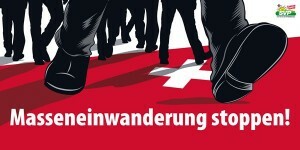 I: Do you think the crisis changed the way, Swiss think about Europe? Fiona: Yes, very strongly. There are these images of the lazy Greeks and Spanish who sit around all day and drink Raki and that the crisis in these countries is their own fault. In figure 1, Swiss people are portrayed as peaceful white sheep, kicking out black sheep almost casually with their hind legs. In figure 2, there is much more fear and threat, as Switzerland is shown as a red carpet, run over by threatening black giant legs (of European migrants). Far more present in our interviews was a different form of racism, present in discourses of enclosure and self-affirmation. „Is Germany like Switzerland who thinks it can stay out of all this?“, asked Michael Hardt in a discussion during the summer school about how Germany is affected by the crisis. What this question (maybe unintentionally) shows is that Switzerland seems to be the synonym for an actor that sets itself apart from the EU, as neutral, not affected, „clean“ – and clean means here, not being contaminated by conflicts, crisis and war from the outside. As mentioned above, in Switzerland, phenomena of crisis are considered as coming from the outside, as „imported“ – insofar as Switzerland depends on other countries. There is a popular belief that there is no danger of a crisis coming from inside Switzerland, but only as a result of external factors that threaten it’s otherwise stable social peace and wealth. Following these popular discourses, the solution for preserving Switzerland from the crisis would be that it sticks to itself and it’s presumed traditional, proven values (discipline, quality of work and products, mutual respect of workers and employers). Stadelmann: In Switzerland, people rarely call a strike. It’s not in our culture. We have good employment contracts, even though our employment laws are quite liberal. But everyone is being very careful. It’s a give-and-take-basis. Another factor for our wealth is the quality of our work and products. This allows us to pay high salaries and ask for high prices. And our high educational level. This is why Switzerland is very attractive for highly qualified persons. Gärtner: If we destroy the wealth of Switzerland, if [EU-]politicians begin to dictate how the economy – that, since decades, is doing really well in Switzerland – should work, and then all the big, important companies disappear, we will have a crisis. We will have a crisis, because we will not be able to pay social help any more. And then comes the crisis, because then comes jealousy. Additionally to Stadelman, Gärtner stresses the importance of the independence of Switzerland from any prescription how its economy should work. He thinks it’s important to keep Switzerland attractive for industries and for rich people to live there and store their capital (and pay Swiss taxes), because this is how the welfare system that guaranties social peace can be maintained. Regulation from the outside would put at risk both, wealth and social peace. While the Swiss identity is being questioned in several ways, this kind of enclosure discourse reaffirms the pure and clean image of Switzerland.